There are plenty of different foods and ingredients that are cropping up in the market that promise great health and weight loss benefits. Some claim to have been around for years but have only just been re-discovered by modern manufacturers and retailers. One such ingredient or food that has started to gain popularity is the konjac plant/root. Although some may say it’s another ‘fad’ food to encourage sales, there are actually some great health benefits to the konjac plant you should know about. Konjac plant, or the root, is a Japanese root vegetable that is full of fibre. It has been used by people in East Asia for thousands of years and is mainly grown in Asian countries. Similar looking to an odd-shaped potato (as they come from the same family as potatoes), it contains a soluble fibre called glucomannan. In fact, it has the highest molecular weight and consistency as any known dietary fibre. Konjac is water soluble and therefore aids digestion. It is able to help strengthen your digestive system, making it a great natural remedy for those who have digestion problems. It can also aid with constipation and hemorrhoids. 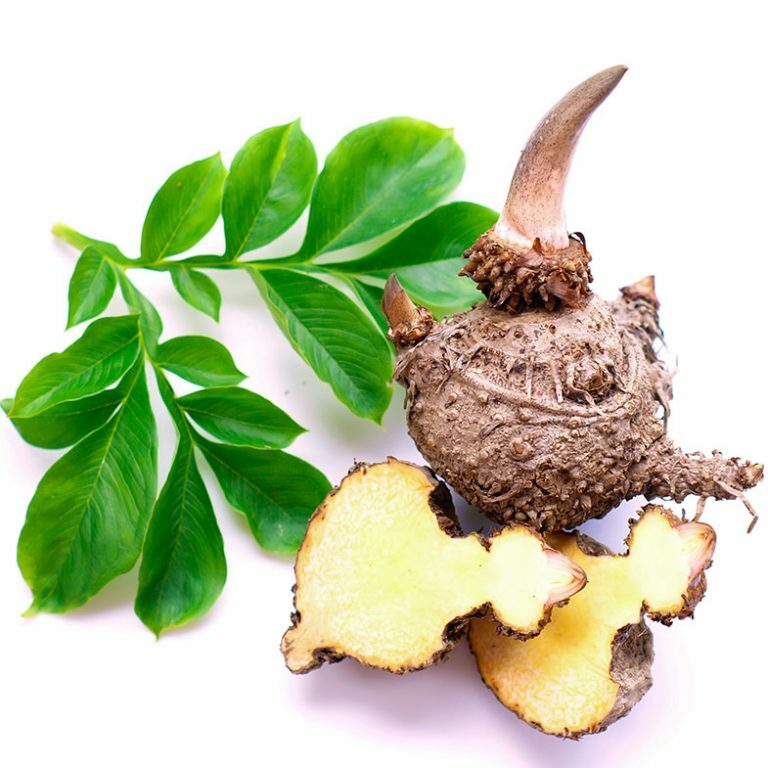 Because konjac contains glucomannan, this is a great agent to help control sugar levels in the body, therefore helping with the control and symptoms of diabetes. Konjac can help the body to absorb minerals, making your daily healthy eating much more useful. By helping with the absorption of minerals, any foods and drinks you ingest will be able to be used more effectively. Because the konjac plant contains anti-bacterial properties, it can help with minor oral health problems such as a toothache. The konjac plant can help to clean teeth and fight bacteria. Because of the konjac plant’s anti-bacterial properties and antioxidants, it is believed that you may gain an increased immunity. Your body may be able to help fight common diseases such as cold and flu more effectively. If you have blood pressure issues, you may want to try and include konjac root into your diet. The plant can help to stabilise blood pressure levels, which therefore will help with your heart health. An interesting benefit to the konjac plant is it’s ability to aid in optical health. The plant can help fight eye related problems, including eye inflammation. It can help to strengthen optical nerves and keep your eyes healthy. Konjac can be used to help increase energy levels and boost metabolism. This is a great option for those looking to increase exercise or help with weight loss. PMS can be quite problematic for many women and girls, but the konjac plant can help by providing added vitamins and minerals to your diet. This can help to overcome some of the symptoms of PMS for women. Konjac contains great amounts of anti-inflammatory agents, which can help with bone and joint health. You might find a way to proper nourish your bones and a decrease in joint pain. This is especially useful for those suffering from conditions such arthritis. If you are looking for a beauty product to help clean your face from daily dirt and grime, konjac sponges are a great choice. Sponges made from konjac can help cleanse the face and thanks to their antibacterial properties, they can help to combat oily skin and reduce acne. These sponges are natural and biodegradable, so when you have finished using them, you can easily put them in your compost. Some reports have been conflicted when it comes to konjac supplements to help with weight loss. Some have found some great results with konjac supplements to help suppress appetite and boost weight loss. By far the best way people have found to lose weight with the konjac plant is by eating foods with konjac as a key ingredient. Foods such as shirataki noodles, rice and spaghetti-noodles have been created which means less carbohydrates and therefore, lower in calories. This is a great alternative for those wanting to continue eating dishes that would usually be higher in carbs and calories to aid with weight loss. With so many health benefits, it’s no wonder that many people are looking for ways to add the konjac plant into their diet and beauty regime. With many foods now incorporating konjac into the ingredients list, it’s now getting easier to enjoy the foods we love, all while gaining health and assisting with weight loss.